Not much new to report coming out of Fukushima Daiichi. NISA is tardy with its reports, as is TEPCO. However, JAIF is a bit more forthcoming with data, and here is the 10:00 Tokyo time JAIF status report. There's really nothing to report here. The probable reason for there being no further activity is the fact that TEPCO got "busted" for not having every single man onsite wearing self-reading, self-alarming dosimetry. This is a government rule there, as here, and frankly TEPCO might in the earliest days have been forgiven this knowing how dangerous the reactors were at that point (they needed action immediately) but after a short while surely somebody realized it was time to bring in some more dosimeters. TEPCO reported only having about 300 plus at the site, which normally as about 5000 available. TEPCO has said it would limit work to ensure every man had dosimetry. I'm also pretty sure they're giving more thorough briefings and debriefings due to the heat being on, as it were; it seems as if TEPCO's management of the situation is just slightly unraveling and the increasing number of not necessarily positive statements about this management by NISA officials means they think so too. Again, the TEPCO people are working under the worst conceivable conditions at the Fukushima Daiichi plant, but personnel safety has got to be top priority. Moving to this side of the ocean, I notice today that GE, at its website, has launched a very vigorous defense of various aspects of its business -- design and construction of the old Mk I containments being primary among its sticking points. Apparently GE is taking the New York Times to task about an article, or rather a set of graphics viewed in slide-show form, and the accompanying narrative. GE doesn't like the Times' representations of the plant designs. Now I'll tell you all something... I was contacted by a NY Times graphics editor for some help in locating plant features on an aerial photo. They seem to be trying to do their homework, and it sure looks to me like if anything the Times might be guilty of misinterpretation of fact, at the worst. GE has a point when it contends that the Mk I containments have been licensed and continued to operate safely and pass vigorous inspections and computer-developed accident scenarios for decades. But there were some definite features .. remote possibility type things, but definite features .. of the Mk I containment that caused the design of the Mk II and then later the Mk III. The point of my bringing this up is to really say this: GE doesn't need to spend that much time defending one of its (oldest) designs against what is truly one of the most horrific natural disasters this generation is likely ever to see. Certainly, GE must feel its business position and reputation threatened by misinformation in the press; my gut feeling is that how this interrelationship plays out will help steer the course for the future of nuclear energy in this country. If the press can be objective enough without giving anyone a free pass, and the manufacturers and utilities can be fully forthcoming with information without being completely defensive, the type of information exchange can and will be achieved that allows the general public here in this country to finally learn something about nuclear energy and thus be able to help make rational decisions about its use in the future. That's the fight I've been fighting here for some time now. What cannot be argued away is the massive nuclear accident in progress halfway back around the world; we must get that situation under control before any sort of future for nuclear energy for GE, for utilities, for media discussion, for our daily use can be discussed or debated. With that, I turn my focus back around the world to Japan. Here, reproduced from an ORNL report which itself used an original GE plant layout diagram is a new illustration for this blog. This is a BWR plant with a Mk I containment like at Fukushima Daiichi, but which shows a turbine building and typical layout. Now, this overall plant layout shown has the turbine building rotated 90 degrees as compared with Fukushima Daiichi. 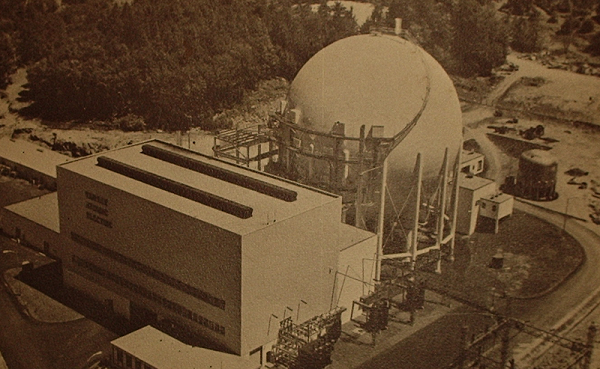 On the plant shown below, the turbine building is "end on" to the reactor building. However, this might help some folks who are wishing they could at least somehow picture what's going on inside the plants now that the turbine buildings, condensers, and pipe tunnels or "trenches" are making headlines. Keep this in mind when you look at the pic -- the features don't match Fukushima of course but it's a good general representation. Remember- click this picture to enlarge it. 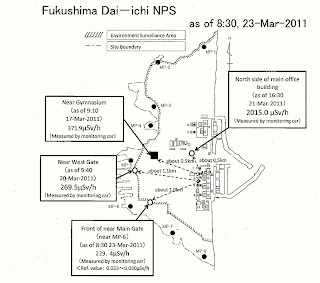 TEPCO survey has revealed radioactive Iodine in the ground water at Fukushima Daiichi site, near the No. 1 plant, at a level ten thousand times the allowed limit. Some readers of this blog have questioned whether or not this had happened or was likely, and given the closeness of the plant to the sea one would have to imagine the water table to be very high. We now have our answer. How is it getting there? Well, the obvious choice would be through the trenches or tunnels so often discussed the last few days and known filled with highly contaminated water in one case, and very contaminated in another (No. 2 and No. 1 plants respectively.) One might easily imagine cracking in the concrete of these tunnels and allowance of the materials into the groundwater that way. Of course, the very high level might also indicate that one of the reactors' coolant is getting right into the ground, perhaps below the reactor building. Any of the reactors could be producing this but the likely candidate seems to be No. 2, which has been producing the highest known activity in water volumes found so far on the site. This is highly speculative -- the business of determining at this early moment of detection how this ground water was contaminated -- but readers of this blog already can suspect any number of paths and sources considering the damage known in reactor buildings, the water found in the turbine buildings and the water in the trenches. Reported elsewhere and skipped here is the attempt to contain or seal contaminants at the site by spraying them with a solution that will essentially "paint" dust and particles in place. This will prevent the material from becoming airborne. This has been done before and worked reasonably well in preventing spread of contamination (although back when it was done around SL-1 it was done with asphalt if I recall correctly.) This time a sprayable resin will be tried. Remember though that this does nothing to neutralize the radioactivity of the substances; it simply changes the nature of the contamination from loose surface contamination essentially to fixed surface contamination... so in order to complete site cleanup (25 years down the road or so, possibly) you still have to remove it. Water level in the tunnel or "trench" at No. 1 plant is down around a meter, and work continues at all plants do dewater all spaces that are normally dry. There is a reading of 400 mSv/hr at the water surface in No. 3 plant.. making it not as hot radiologically as No. 2 but significant nevertheless. Looking at the latest figures, the feedwater nozzle temperature on No. 1 unit is down about 30C since the last time I reported it, which is encouraging. Temperatures at No. 2 have been coming up a bit .. and the lower reactor vessel head temperature indication has failed. No. 3 appears stable. These are the new details and developments. The serious focus on dewatering continues. Many people have seen drawings of the containments at Fukushima Daiichi, and some terms are starting to get tossed around in the press. Further, some sharp eyed readers have noticed that the cross sectional views for Fukushima Daiichi No. 6 are different from all the others... and that's right! No. 6 has a Mk II containment, while all of the rest have the Mk I containment. 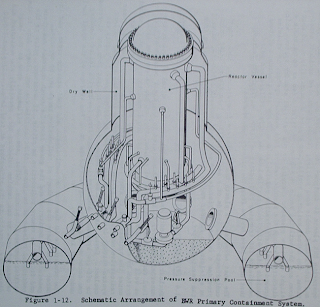 The containment with the toroidal suppression pool at the bottom is known as the Mark I or "Mk I" containment. That by no means indicates that these are standardized in all facets; some plants have larger dry wells, some smaller. Some reactor buildings have more floors than others. Some have doors that seal off different levels, some don't. Some have multiple entries into the reactor building, others fewer. Some have a larger volume than others. 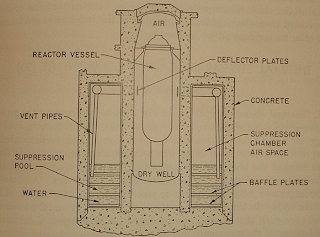 What is "standard" then on the first range of boiling water plants is the use of the basic design we've seen so often on this blog.. the use of a reactor vessel mounted high up in a drywell, below which is a suppression chamber formed from a toroid and connected by pipes to the drywell. Here, from WASH-1052 is one further representation of the Mk I containment. This was not the end of the line for design changes. A superior design was developed which had more internal volume, generally, and a more solid construction. This is the Mk II containment which dispenses with the toroid and instead incorporates a suppression pool as part of the building itself. 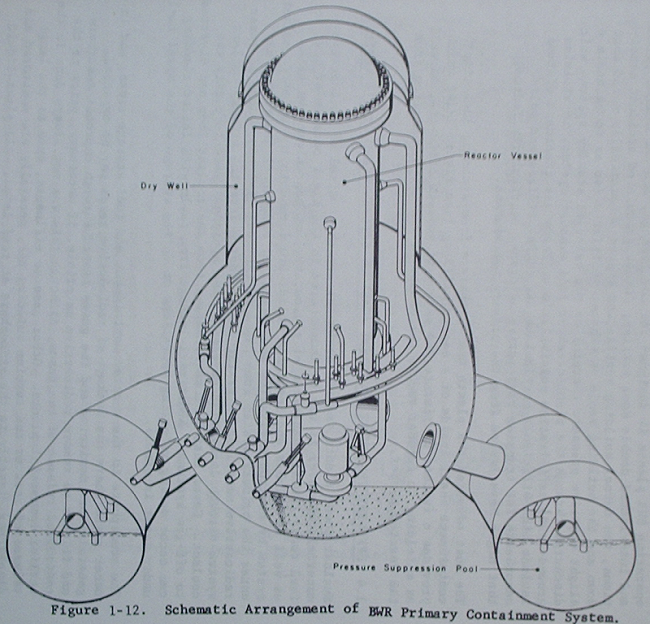 Below is an illustration of a typical BWR Mk II containment, from WASH-1052. Of all the plants at Fukushima Daiichi, only No. 6 is new enough to have been built with the Mk II containment design. All the rest are variations on the Mk I design. 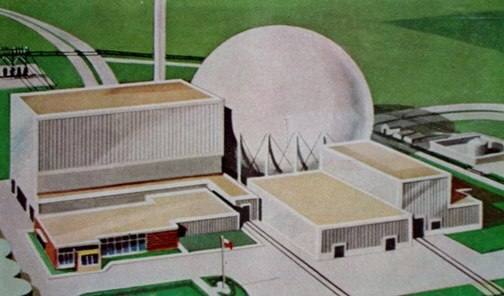 Eventually a further design was evolved, which doesn't use a reactor building constructed on top of and on the sides of the secondary containment. Instead it uses a large cylindrical, dome-topped vapor enclosure very like that used on PWR or pressurized water reactors for many years. This is the Mk III containment. Below, again, from WASH-1052 is a BWR Mk III containment. None of the plants involved have this style, by the way. Now that this post is made, readers have seen not only the whole genesis of the "suppression chamber" concept of containment, but also know where the affected plants at Fukushima Daiichi fit in the overall design line. 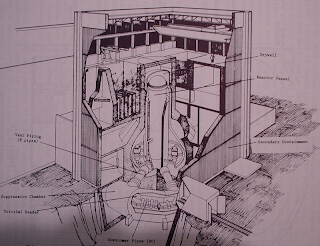 Note that on the Mk III there is no chance that such devastating hydrogen explosion damage can occur; on the similarly designed Three Mile Island reactor containment (a pressurized water reactor is inside) around 700 pounds worth of radiolytic hydrogen burned and the structure was not damaged. Pressure rose to over 25 lbs / sq in but the structure contained it, as designed. This is exactly why the Mk III is designed as it is, and this is fitted to all new BWR plants. Iodine 4385 times the standard limit found near Fukushima Daiichi plant in the seawater. Here is the latest JAIF document to be made available. There isn't much news in this, except the note of gradually increasing pressure in No. 1 plant's pressure vessel. Apparently much work at the site has slowed, or been stopped, as a result of the problems with contaminated water in the turbine buildings. Various reports have come out that the levels in the No. 1 and No. 3 buildings are higher now, not approaching the very high level in No. 2 but contaminated nevertheless. We are getting a LOT of comments, and questions, and suppositions about just how this water, which has clearly been through the reactor core in the case of No. 2 plant, might be getting out of the reactor and into other buildings. The short answer is that it's way to early to tell. The long answer is -- there are many ways. First, we already know that serious fuel damage has occurred. The reactor cores have seriously overheated. Hydrogen emitted from the primary coolant being broken down by neutron radiation, and possibly by metal-water reactions, has caused explosions in No. 1 and No. 3 reactor buildings. There was an explosion heard in No. 2 plant, thought to have been low in the reactor building, as in at the location of the suppression pool; this may have been a hydrogen ignition in the drywell, after hydrogen leaked into it, or perhaps it was the result of a pressure vessel failure (steam explosion.) This much we already know; what we aren't sure of is how the mixture of water and fuel material in solution is getting out. Normally all of this would be kept in the primary coolant system, or any of the attached systems that handle primary coolant ... there are systems to sample coolant, systems to add coolant, systems to relieve pressure, systems to clean the coolant and remove radiolytic gases. All are connected to the reactor pressure vessel by pipes of course, and all of these have to get in and out of the reactor building. Oh, and let's not forget the large pipes to get steam out and feed water in. All of these have connections to, and thus penetrations through, the reactor pressure vessel. Below is a shot of a very large pressure vessel for a Boiling Water Reactor, being moved out of Babcock & Wilcox's large Mount Vernon, Indiana plant in January 1969.. from APRA files. This pressure vessel weighs about 1,600,000 lbs, and was on its way to Dresden Nuclear Generating Station for Dresden 2 or 3. Note the pipe penetrations all over the pressure vessel. Some of the penetrations on the vessel aren't for pipes that run to, or back from, the turbine building or auxiliary spaces. There are also penetrations for control rods on the lower vessel head, and a number for jet pump recirculation. 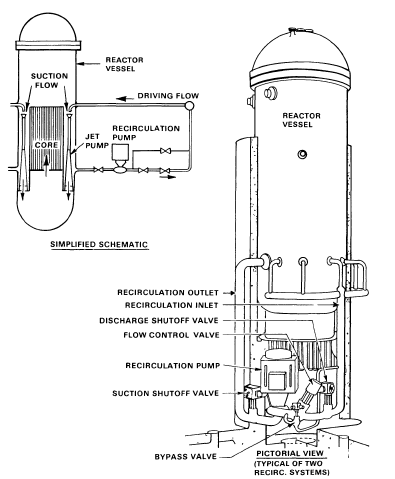 Here is an illustration from WASH-1052 showing a typical BWR reactor vessel and the externally mounted recirculation piping. The recirculation of water in a BWR was an idea developed a long time back; it allows a higher power generation per unit size. Very modern BWRs have all the recirc equipment mounted inside, greatly reducing complexity. Considering all these penetrations -- there are many others not shown too, such as those to detect water level, pressure, and of course don't forget the many penetrations for the control rods that I haven't shown yet -- there are quite a number of places that the leak could be coming from. What is clear is that the water and core material and gases are getting out and are either going directly to the turbine building, like through the feed and condensate system, as one example, or else getting into the drywell and then out through one of the connected systems there -- there are ways to get water in and out of the suppression chamber too. I mentioned this over a week ago, on this blog -- clearly TEPCO and / or the NISA feel that not only core melt, but maybe pressure vessel failure, was possible because they used seawater to flood the drywells on at least No. 1 and No. 3 plants. Normally the drywell is just that -- dry. But one line of thought on accident mitigation and control is that if you're fairly sure the pressure vessel is in danger of failing, or has failed due to a core melt, then the flooding of the drywell with water will slow or stop the progression of the damage. The only plant that I cannot prove it was done on is No. 2, which appears to have the worst releases of fission products underway of the three. I have deliberately avoided anything like wild speculation here, and won't engage in it now. But now perhaps even the layman can see that there are so many possible paths that the various materials COULD be taking -- and can see that it may well be different on each plant -- that speculation is risky. Couple whatever damage was added to the overheating damage by the hydrogen gas explosions and you have a serious range of possible paths for this water to be getting out. And again, this could be entirely different on all three plants. Very little new technical data is coming out of Japan, likely because the situation is not nearly so fluid as it was before. Here are some updates. The level of radioiodine in the water south of the plant has spiked to an incredible 3300+ times the allowed limit. No one has yet said how this is getting into the water; the likely suspect is No. 2 plant. The condenser hotwell is full at No. 1 plant, leaving roughly 20cm of water in the turbine building. Now the water transfer problem becomes more elaborate. NHK has reported a barge on the way to be brought into the breakwater or next to it to receive contaminated water. All four plant control rooms have lights. They do NOT have I&C. There was a fire at No. 1 plant late on the 30th, at 5:56 PM. This was a fire in what was described as a power panel for a 'drawing water pump to the outdoor duct.' This sounds like a motor controller for a seawater pump, and actually no fire was observed but smoke issuing from the equipment. Once deenergized, the smoke stopped and the damage is limited to just that panel. Unsurprisingly TEPCO's upper management has admitted that Fukushima Daiichi No. 1 through No. 4 will be decommissioned. No mention was made of No. 5 and No. 6 or for that matter the planned but not under construction No. 7 and No. 8 at the same site by TEPCO. However, Chief Cabinet Secretary Edano is advocating the decommissioning of all reactors on the site. The latter position is the one we figured would be taken, and wrote about here a while back. UPDATE: Various Japanese media are saying that the controller fire occurred at the Fukushima Daini site's No. 1 plant, but there are two TEPCO press releases stating that this was at the Fukushima Daiichi No. 1 plant. Folks, I have in my hands here one of the worst examples of news reporting in the history of the news media's love-hate affair with nuclear energy. This new pinnacle -- or is it depth -- has been found by Newsweek in the March 28 - April 4 issue and is penned by someone named Simon Winchester. There are quite a few sources available on the SL-1 accident. I've read them all. Now, while a number of these require use of the FOIA privileges given US citizens, there are a whole lot that don't. Look in the "fukushima accident" sources given on a separate page on this site, and you will find quite a number of these contain a great deal of technical data on the SL-1 plant and accident. Major design data is found in the book "Boiling Water Reactors" that was sponsored by the AEC, and distributed at the 1958 Geneva Conference. 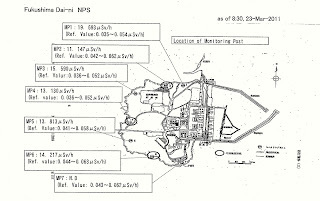 Nuclear data and operating details are to be found in the book "Nuclear Reactor Plant Data - Volume One - Power Reactors" that was put out by the ASME in 1959. Accident data are given both in the AEC's WASH-1250 report (we have a final draft copy here) and are also mentioned in "The Second Nuclear Era." In the earliest sources, the plant is called ALPR which is short for Argonne Low Power Reactor, which is what this plant was called before being given a new alpha-numeric designator as SL-1. Three military service men were killed in this accident. Their deaths were accidental; in no report that I have ever read which was written by the AEC, Combustion Engineering, or General Electric was any mention of deliberate murder-suicide ever made. It is deeply insulting to me to see this accident, resulting in the death of service members, reported as being driven by extra-marital affair or some such scandal... which of course, true to modern "reporting" style is the last phrase that Winchester leaves us with in the article. Further, anyone who does even six or ten minutes of research will find out that the SL-1 reactor did NOT have only "one central rod." 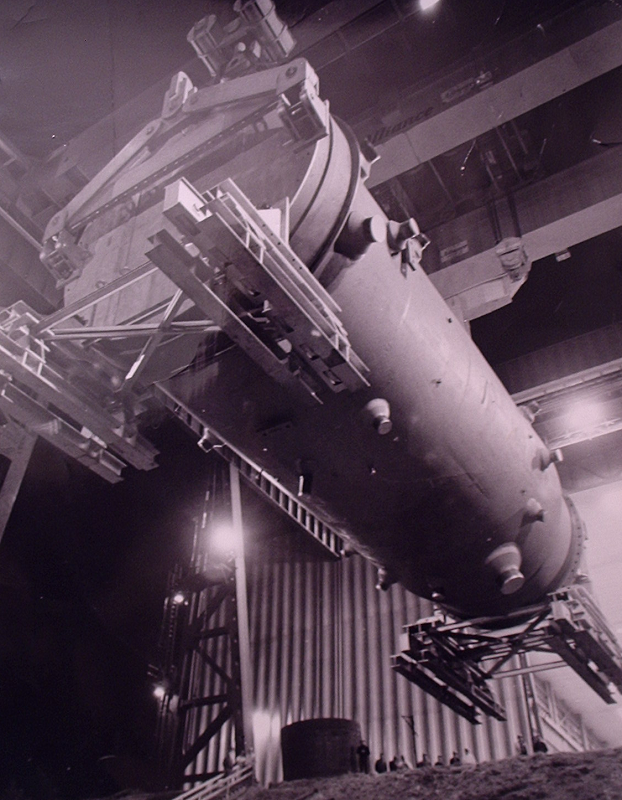 The reactor had five cross-form control rods installed in the core with design provision for four added "T" shape rods to be used also if the core size were increased from a 40 fuel element load to a 60 fuel element load for increased output. The five rods that were installed weighed 49 lbs each, and had a 32 inch long active neutron absorbing region. The five rods all together had a total reactivity of about 14% delta K (that's for you nukes out there, right from "Boiling Water Reactors") but in normal operation these rods' drive mechanisms limited outward movement to 3 inches per minute, which related to a reactivity addition rate of 0.01% dK / sec. In other words, for you non-nukes out there, although the rods had a very high total potential effect on rapidly raising the fission rate, when they were normally operated their movement was exceedingly slow in the out direction -- the mechanisms simply could not move them any faster than this. As to the accident, several sources (WASH-1250, "The Second Nuclear Era," "The Atomic Energy Deskbook") relate the inadvertant manual withdrawal of the center rod (one in the middle, four around it) that caused prompt criticality. Right here in "The Atomic Energy Deskbook" is a brief summary done by expert author John Hogerton of the AEC's findings as of June 1961 which to my knowledge were never overridden. Hogerton lists three important points that I'll summarize myself below. 1. The accident was a result of a nuclear reaction. 2. The reaction was a power excursion resulting from abnormally fast and high motion of the central control rod. 3. 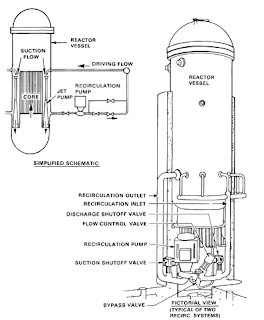 A variety of conditions had developed in the reactor in its operational history prior to this including STICKING CONTROL RODS and loss of burnable poisons. During maintenance, the rods had to be lifted a bit to perform work and apparently the operator experienced sticking of the rod, and excessive force caused it to move upward too far. This was not a murder-suicide. It was an ACCIDENT. There are a number of other total fabrications in this Newsweek story .. for example, the reactor was not buried but cut up at GE's "Hot Shop." I recommend going to the Idaho National Engineering Laboratory site and finding the excellent history of the facility... called "Proving the Principle - A History of The Idaho National Engineering and Environmental Laboratory, 1949-1999" by Susan M. Stacy. I read this when it was first released to the public and a check just now shows it's still there. The SL-1 chapter will tell you anything you would like to know to debunk the Newsweek article; however, if you want the truth you already have it and need not trouble yourself. The piece starts by mentioning Indian Point. 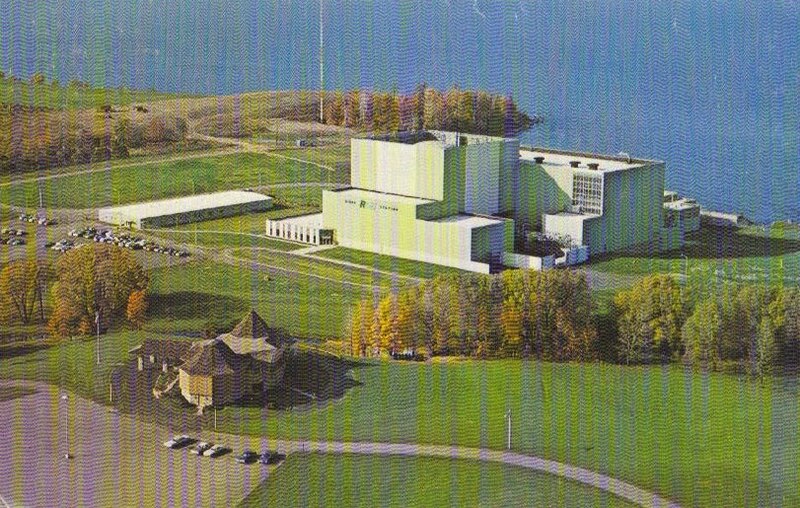 That's a nuclear power plant (two reactors operating, one decommissioned) at Buchanan, New York. It says that the plant is 35 miles from Manhattan where 17 million people are. It then goes right off into how a meltdown scenario might go, as related by non-nuclear expert Caldicott. Horrific details are given of casualties, and jammed escape routes, and so on. What started the meltdown? Oh, right. You forgot that part. See.. that's how fearmongering to sell papers or web hits works. You mention a lot of people, like in New York or else in Los Angeles (oh, no! There are nuclear plants there, too!) and then posit a sourceless disaster to get them to want to read more. If this is about the supposed fault structure near Indian Point and if that hasn't been cleared up already then maybe in another post I can relate all of the data in one of the newest volumes to arrive here; this book is titled "Geology In The Siting Of Nuclear Power Plants" and contains a great deal of data specific to the Indian Point case. There is also data in WASH-1250. Let's close this post with this point: It's time that the big media stops hitting up their normal hacks for reports on topics they do not, and CAN NOT, understand. It's time to get the bias OUT of the media, and time to get honest reporting of facts without deliberate misinterpretation back INTO the media. Newsweek hasn't gotten that figured out yet. But that's all right - you have this blog for all things nuclear energy related. No. 1 reactor continued to show an increase in temperature after a decrease in cooling water flow was made; the idea is to provide the proper amount of cooling while not over-using water. Since the temperature was increasing, the flow rate of injection water to the core was increased from the previous 113 liters/min to 140 liters/min. The temperature continued to rise for a short while, but seemed to have leveled off at the time of the briefing. Hoped to get the temporary fresh water pump and diesel generator working today. Had hoped to use a concrete truck with long arm to spray the spent fuel pool but the truck has experienced a failure and may not be repaired until the 31st. As a result, the pool has lost a little water and heated up a little but the situation is not serious. DC electric system work continues. Three pumps working to move water from basement into condenser; water level in basement not going down very quickly. No. 2 plant changed to freshwater injection with the new setup days ago, and hopefully today will begin using fresh water on the spent fuel pool. Water relocation effort underway to clear condenser to get turbine building water into it. No. 3 plant had the new temporary electric pump setup put on line 8:30 yesterday, using fresh water. Electric work continues, focused on 125V DC today. No. 4: Nothing of note. Trenches outside plant will be monitored every 12 hours. The drains for the trench at No. 1 plant have been buried to prevent any water exiting, but this hasn't been deemed necessary at the other plants yet. THIS WAS THE DATA given during the last brief. A check of the last available temperature data shows a feed nozzle temperature of about 304C on No. 1 plant, which is way back up where it was about a week ago, echoing the NISA statement. There are not a lot of new details coming out of Fukushima Daiichi, NISA or TEPCO today... work is continuing on just a few very important areas right now. Here's what we can deliver.. Apparently the reduction of injection volume to No. 1 plant eventually led to a temperature rise higher than when the reactor is normally operating, according to TEPCO representatives... the water injection has been increased again. The plan for the turbine building 'unauthorized' water in all three plants is to get it into the condenser hotwells, which reportedly can hold 1600 tons of water. In two plants, though, the hotwells are already full. The plan for these is to get the water presently in condensate storage tanks pumped into the suppression pool surge tanks, and then pump the hotwells to the condensate storage tanks. This frees up the condenser hotwells for the large water volumes now found in the turbine building basements. No other real plans of note have been released; obviously the major focii of today at Fukushima Daiichi have been dewatering the turbine buildings and monitoring the trenches while at the same time ensuring proper core cooling. TEPCO needs to tackle this displaced (and in some locations contaminated) water situation as soon as possible, and as far as we know now, hasn't released a plan for dewatering the trenches outdoors. In an unrelated location, Chubu Electric Power has run a fantastic drill sequence at its Hamaoka nuclear station, and press were allowed. The company ran an SBO sequence in its control room simulator, showing what occurs and the operator responses. After this, outside, the company staged practice drills of bringing in fire trucks to supply emergency cooling water and portable diesel generator equipment for emergency power. The company said this is part of its response to knowledge of the Fukushima Daiichi accident, and it has also announced plans for a roughly 36 foot high protective wall around the Hamaoka plant. Chubu is getting it right -- respond to the accident scenario quickly and show the public that you are doing everything you can figure out to prevent this happening again. 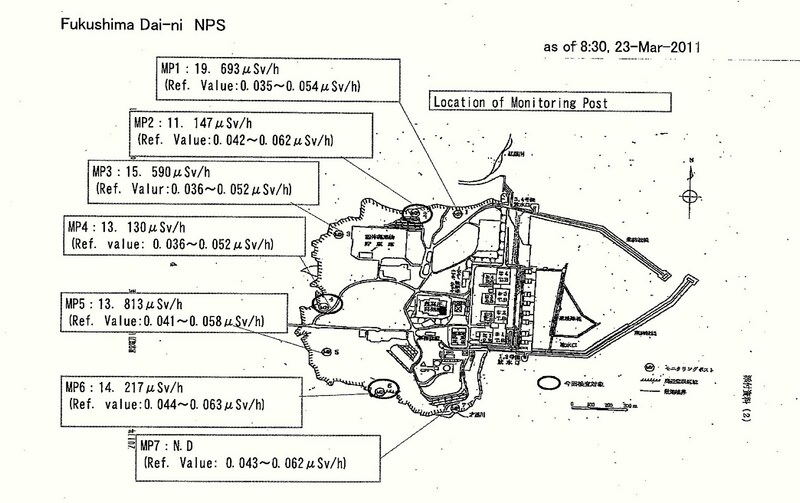 TEPCO, NISA and the Japanese Government now clearly associate the volume of water in the trench at each plant with the core cooling water that has been injected; further, and probably more importantly now, they all also associate the volumetric flow rate of injection water to the reactor cores as being roughly directly transferable to the trenches. What? What I'm saying is that X gallons injected to the reactor core will result in the short term in something less than X into the trench.... with buffers being the water getting through the reactor building, and/or turbine building. Let's make something clear: Two breaches are in progress for this to happen. First, the water should not be getting out of primary system piping, and if it is it shouldn't be getting out of the reactor building -- that's what the ocntainment function of the reactor building is all about (and if you haven't seen my previous post on the subject of containment, please do so.) Next, the water is also, once in the turbine building, then getting out of the turbine building into the trench, somehow. It's TWO places it shouldn't be. Because of this direct relationship, TEPCO reduced the flow rate of water to the core of No. 2 plant and -- as we might guess -- has experienced a reported 20C increase in core temperature. Chief Cabinet Secretary Edano has stated publicly that when consideration is made, the priority is core cooling and water injection will be adjusted to ensure core cooling and not to prevent overflow of the trench. TEPCO has buried the trench drains. It's now totally clear, in the very short term, that continued reactor integrity is going to be based on the ability to inject water AS NEEDED for core cooling with no incentive on anyone's part to prevent further spread of contamination from the trenches. It may be time for another brutally simple but aggressive solution - you could bring in a very large barge into which to put the trench water and further discharge. That sounds difficult, perhaps, but it might not be. It's time for the solutions to get ahead of the problems and not simply keep up with them... keeping in mind Patton's advice that a good solution applied vigorously is better than a perfect solution applied too late. Now that we've gotten some more solid data, let's talk about what's known and what it might imply (if anything) and what can be done. Each turbine building has, outside of it, underground and heading toward the ocean, a tunnel. The tunnels contain pipes and wires.. the pipes are for cooling the condenser and the diesel generators. This tunnel is a separately poured concrete structure from the turbine building; in other words it is its own area, with its own walls. The wall between the turbine building is not a common wall; there are separate walls for each structure. Rubber seals and other types have been used to seal pipe penetrations. The trench doesn't run all the way to the ocean. Now, access to these "trenches" which really are tunnels is through two fairly large manholes; one right near the turbine building and one further down toward the shore. These manholes actually cover shafts that run as much as 60 feet or so down to where the trench or tunnel actually is. All three plants have water in these manhole shafts nearly all the way to the top. In other words, not only is the trench or tunnel full but the access shafts are nearly filled up, up to ground level. ONLY IN NO.2 PLANT IS THE WATER HIGHLY CONTAMINATED IN THE TRENCH. This water measured over 1000 mSv/hr just like the water in the turbine building. The water in the other two plants' trenches is not anywhere near this, and seems not to be a problem right now. But the contamination level in No. 2 plant's trench is a concern. Probably the best thing to do in the very short term would be to rig up a submersible pump that could be lowered into the manhole, fitted to a pipe with a filter or two in line. The water could then be pumped into a tank truck, or a couple of tank trucks, and moved away to another location on site, still in the trucks, to wait for further filtration and disposal or else left to sit for decay. If the water were out, further buildup could be prevented and access of this water to sea would be made much more difficult. NISA isn't exactly sure how the water got into the trenches given the sealing applied to the pipes. However it's pretty certain, at least in my eyes, that the piping seals are sure to be found the culprits since they're meant to seal off the areas but not hold continuously for a week or so against deep pools of water in the plants. Or, perhaps condenser or seawater pipes are ruptured; or the tsunami flooded them somewhat through the manholes if they weren't sealed properly. Or there may be cracks in the turbine buildings and the trench walls. No one will know until they can get down there, and that won't happen until the water is all out. The major inter-industry flap will be because the trench, outside the turbine building, is not considered as a "controlled area" whereas the turbine building (and of course the reactor building) is a controlled area. Every effort is always made every day in normal ops to prevent contamination in any uncontrolled area. Sure, you don't want it anywhere at all but the presence of any contamination in an uncontrolled area is considered serious. HOWEVER, given that there are destroyed reactor buildings, release of radioactive contamination into the air and ocean already, I'd have to say that this is a minor problem at this particular moment. I would hope that the tank truck method would be used to quickly get this water into a controlled condition. More surprisingly, NISA was known to have been conducting meetings yesterday about pressure vessel integrity at the No. 2 plant and was expected to issue an update and some details but none have come out. NISA officials, and Chief Cabinet Secretary Edano have, in briefings, begun to appear a bit less tolerant of TEPCO's mistakes; TEPCO has apparently indicated the high level of fatigue of the personnel at the site. Today we will have some very interesting material to present which I'm sure will generate a fair amount of comment. That's coming later on this afternoon. It is not apocalyptic but rather highly informative. TEPCO has announced that highly contaminated water has been found in an underground pipe tunnel at the No. 2 plant - meaning that it has leaked out of the building and into a man-made exterior structure below it, and which extends towards the shore. The water most likely made it out around pipes and wires, I'd have to guess or through crevices formed during the earthquake or one of the many, many aftershocks. Chief Cabinet Secretary Yukio Edano has just revealed on live TV that, after briefing him on some details, NISA is having a closed door meeting at this time to discuss the possibility of a reactor pressure vessel and/or drywell failure at Fukushima Daiichi No. 2 plant. They're positive that the water in the turbine building is coolant that was in contact with melted fuel. We're expecting further details on this important discussion later today. It's the morning of the 28th in Japan, and NISA (Nuclear and Industrial Safety Agency) has just given another briefing. The able Hidehiko Nishiyama, always the morning briefing point man for NISA, gave the particulars. We were hoping to stall long enough to get the copy of the documents that accompany this briefing, but they're not available yet so in order to remain timely we'll run what we have... which in all likelihood won't be contradicted by anything in the briefing papers. We still read them anyway. Details given this morning: In general, applicable to all three reactor plants which were at power when the quake hit; all will eventually be changed from having fresh water injected to the cores by fire trucks (pumper trucks) as they are now to electric pumps. The fire trucks need to be refueled fairly often, and this arrangement is not necessarily the best. Electric pumps for each plant will be placed in a temporary arrangement, powered by diesel generators. To ensure total separation of the plants, and any event at any one plant, every plant will have its own dedicated portable diesel generator and fresh water pump. No. 1 plant's reactor pressure vessel temperatures are rising again, and fresh water injection rate will be adjusted upward to correct for this. (Last time I saw a new number the feed nozzle temperature was about 204C.) This plant should get its electric water pump and diesel generator on the 29th. TEPCO has added two more fire pumps to the one working the turbine building basement water pool which has developed in order to get this contaminated water into the condenser hotwell. At No. 2 and No. 3 plants, the condenser hotwells are already full or very nearly so and this water -- which isn't contaminated so far as we know now -- might be simply pumped outside or to sea in order to get the hotwells empty to make room for the water in the basements. Nishiyama's remarks, though, leave some opening as to the plan for No. 3 plant since he indicated they're still deciding what to do with that water. The cyclical nature of watering the various spent fuel pools, now using the concrete pumper truck and various 'water cannon' vehicles continues as needed, albeit with fresh water now. We'll be looking for the NISA and TEPCO documents to appear fairly soon, and likely some JAIF status charts a bit later. Earthquake off coast of Miyagi Prefecture. Tsunami warning; 50 cm+ height in concurrence with high tide possible. UPDATE: TEPCO and Tohoku Electric Power Company are now both reporting no anomalies at any nuclear power plants as a result of the quake. 6:49 PM Eastern: TEPCO reports a quake of about 4 was felt at Fukushima Daiichi nuclear generating station. No damage has occurred as a result of this quake; the site has already received a quick inspection. 9:49 PM Eastern: All clear issued a long while ago -- no effects have been noted at Fukushima Daiichi. A very shallow and small tsunami did come ashore but it was little more impressive than a slightly fast high tide. There is a sliver of evidence this morning (in Tokyo, anyway) that TEPCO thinks that continued fission is NOT occurring above natural decays in the Uranium fuel at Fukushima Daiichi No. 2 plant. The water in the basement of No. 2 plant's turbine building is not ten million times the activity found in normal reactor coolant. It's one hundred thousand times the activity found in normal reactor coolant. A major reduction to be sure, but the figure of activity one hundred thousand times that of normal reactor coolant is just as indicative of massive fuel element failure as a figure of ten million times or even ten times that. Or fifty thousand times. The figure changes, but the direct evidence is exactly the same. The isotope Iodine 134 is now said to have been undetectable when TEPCO reexamined the data taken from the survey. One media outlet is saying that another isotope is indicated; another media outlet provides no further data. This doesn't change the fact that, even in the latest releases of data that TEPCO is still finding a number of other fission products in the water. This MIGHT indicate that the idea of an increased fission rate .. not approaching criticality, indeed, but increased ... is now no longer valid if the very short half life elements aren't being found. It still goes along with the earlier fact to indicate massive fuel damage. One further piece of information is the fact that the 1000 millisievert reading was obtained with a radiac that "maxed out" or "pegged high".. the operator departed the area without trying a higher range instrument, or resetting his (if it had a higher range.) We might then very safely say that the rad level detected was >1000 mSv/hr. We will have to wait for further details. Serious core damage, given the new data? Of course. Core melt? Partial melt, very very likely. Full melt, hard to say. Failure of reactor vessel, or a bottom end penetration (for instruments or control rods) or near the support flange by melting? Possible. Primary containment (drywell and suppression chamber) failure? Virtually assured, and TEPCO is saying just exactly that. We'll keep a close eye on the specific announcements related to the plant, sift them out and present them here with analysis... as has been the convention for a while now. Further note on the water removal from the turbine buildings: The condenser hotwells at No. 2 and No. 3 plants are already full, so that the water pools building up cannot be pumped into them without emptying them first. One of our readers, Keith, has sent a link to a very good article (and a very recent one) on the BBC website, regarding radiation exposure. It's written by someone in a good position to know. BBC: We should stop running away from radiation. This is a very non-hysterical article, unlike most being published in the general media today. People might ask "how can you not be frightened by all this," and I might respond "how much more frightened are you going to try to get, knowing that you'll never have any effect on you personally due to this event whatsoever?" The radiation field in the No. 2 plant turbine building at a location in the basement adjacent to the reactor building is as high as 100 Rem/hour. This is probably the total dose rate both from any rad field from the reactor and from the water in the building which is highly radioactive, being some ten million times more active in a radiological sense than normal reactor coolant in a critical reactor. The latest available JAIF document shows little change, except for a small pressure increase in No. 1 reactor. This reactor has showed consistently higher pressure for some time now than the others. Work continues to dewater the turbine buildings. Obviously this water is very highly contaminated and surely some surface decontamination will be necessary to allow work to progress in some of the areas in order to get feed & condensate systems operable in order to re-establish normal shutdown cooling. On the news wire right now from Kyodo are some statements we already knew and one that's somewhat surprising. The somewhat surprising statement is that now the seawater off the plant is no longer just about 1250 times the limit for iodine but something like 1850 times the limit. We just don't know how much more clear it can be that there is serious core damage in all three plants... from the high radiation fields, to the spread of fission products in the region and in food, to the apparent reactor coolant now filling up the turbine buildings. Is there primary containment breach? Unless there are relief valves stuck open, or feed lines broken, there's little other way for all the coolant and products to get as many places as they are.... and the destruction of the reactor buildings by radiolytic and/or metal-water generated hydrogen certainly does not help. Still somewhat surprising is the continued status on various JAIF documents indicating that the containments... that is, secondary or concrete containments.. are not damaged. Is that credible? I wonder. Although the "reports" of the enviro-militant Comprehensive Test Ban Treaty Organization seem to make some press when they claim to have detected radioactive contamination everywhere (how long before they report it on the moon?) it's better to just stop panicking and believe someone without such an agenda. See the actual test reports vis a vis airborne radioactive contaminants at that link .. for the whole LA area. TEPCO is going to begin moving the water from the turbine buildings into the condenser hotwells in No. 1 and No. 2 plants. Attempts to switch to internal systems are still being hampered by this water. Conditions at the plants aren't changed all that much; freshwater injection continues to the reactors. The US Navy is now not only going to provide fresh water for the reactors and the spent fuel pools but technical support as well. This means NAVSEA 08 or Naval Reactors, more than likely, judging from a statement made by the Commander of the US force providing assistance. Investigations continue into the deposition of activity into the seawater, the deposition of activity into the turbine buildings and the general environment .. but it's clear that there is core damage and release of primary coolant, and then probably as well some of the water added during the accident. Let's take a moment, now that the constant flood of news information out of Japan has slowed down a bit, to briefly review what has happened at Fukushima Daiichi and look at some details being brought up by various media.. and by the "various media" I mean ERRORS and SUPPOSITIONS in the media. The first event that occurred at Fukushima Daiichi was an earthquake, which caused all three reactors that were operating and producing power for the grid to full scram and trip their turbine throttle valves. Emergency diesel generators start instantly and are on the local plant grid instantly on the receipt of such signals, to power instrumentation and control (I&C) systems that use remote indications and remote controls in the control room to operate the reactor plant, as well as to power many varied electric pumps and valves. Although a scram from full power like this can lead to a brief relief valve lift, it isn't an accident causing event. The next thing that happened was the part of this natural disaster that has caused the most damage; a tsunami of truly historic size and power that has never been seen in Japan in recorded history. This led to what essentially amounts to the dreaded SBO DBA sequence (Station Blackout - Design Basis Accident) which in the most severe postulated cases leads directly to core melt. In the scenarios run on computer simulations for various types of containments (and we'll talk about that in a moment) and various power ratings of reactors in which operator actions are totally ineffective or else wherein there are no operator actions the result is always core melt in somewhere between 11 and 13 hours and in those cases the containment fails around one hour after that. This was not entirely the case at Fukushima Daiichi; the operators have battled with the plants and systems at every turn for almost the whole time. Furthermore those SBO sequences don't include a period of time, as at all three plants, where decay heat is being removed by normal systems -- these worst case scenarios occur with a total loss of all AC power from 100% reactor power. There was time to remove enough decay heat, apparently, at Fukushima Daiichi's three operating plants to hold off the time until very serious core damage occurred for quite a while. We might look back in our timeline to the hydrogen explosions at No. 1 and No. 3, and the audible explosion in the suppression chamber at No. 2 to guess about when the core damage was occurring most severely. So what is all this about "containment," and "suppression chambers?" Containment put simply is the system of barriers that prevents fuel and fission products from entering the environment. The first barrier is the fuel itself; if that fails, the radioactive material must then somehow get out of the reactor vessel and / or the associated piping that hasn't been shut off by valves. This layer is actually referred to as the primary coolant system and is really the primary barrier. Next is the secondary barrier, meant to contain the effects of a primary coolant system failure. Just what that means -- the amount of pressure and heat and radioactivity, or in other words the total amount of energy to be absorbed -- has varied over time. 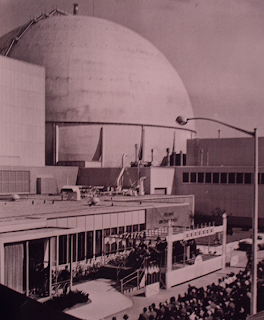 In many early reactor plants, the common sight and one that captivated public attention was a massive vapor containment sphere. A number of early plants used this, including the Dresden Nuclear Power Station, which was America's first large boiling water commercial power station. Here are some views. First we see a pre-construction elevation by Bechtel Corporation of the final plant layout. 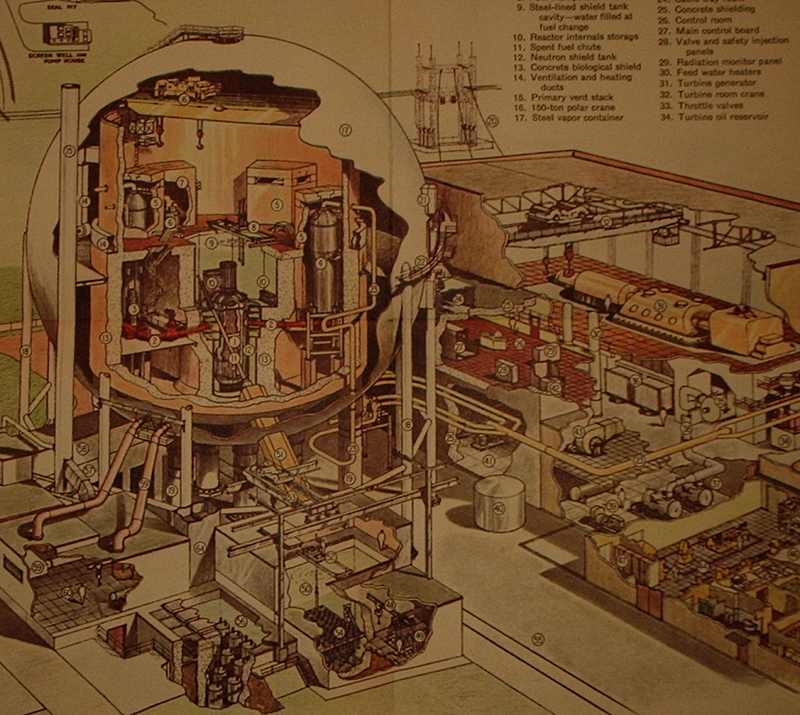 This is the second overall layout originally conceived for the plant; initially the turbine generator was to have been included inside the giant sphere seen in the overhead view. And we do mean giant... the sphere for this plant was one of the largest ever built, measuring 190 feet across and built of steel plate over an inch thick. Below, also from the APRA collection is a press photo of the dedication of the plant on October 13, 1960. This massive sphere was intended to contain the effects of a total release of all the energy in the primary coolant should a rupture occur, and could also contain the pressure pulse of the maximum conceived hydrogen burn; the design pressure was 29.5 pounds per square inch but the test pressure of the structure was 37 psig. The maximum credible fast leak, with zirc-water reaction of 25% of all zirc in the primary would have resulted in a sphere pressure of 31 psig; if the secondary (this was a dual-cycle boiling water plant) steam were released due to missile damage from a severe primary rupture, internal pressure would have been 34 psig. As an aside, originally these large structures, extremely expensive and complicated ot build, were also used at pressurized water reactor plants. Below is an external view of Yankee Atomic Electric Company's plant at Rowe, Massachusetts which first went online in November, 1960 - one month after Dresden, pictured above. 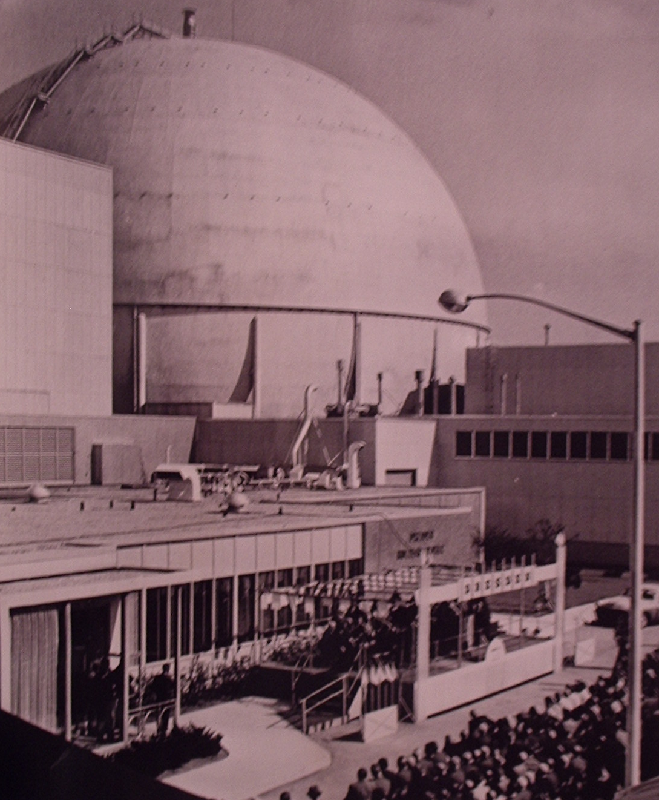 Whereas the sphere built by Bechtel and GE for the 626 MWt Dresden was 190 feet in diameter and had an internal volume of 3.6 million cubic feet, the sphere for the Westinghouse 392 MWt pressurized water plant at Yankee was 125 feet in diameter with a volume of just over 1 million cubic feet. Design pressure was 35 lbs. Below from the same brochure in the APRA collection whose cover is shown above is the internal view of the sphere. Note the heavy concrete radiation shield, or biological shield, built around the reactor but inside the sphere. Of particular interest in this illustration is the angled chute seen leading down from the vapor containment sphere, into a building on the ground in the lowest foreground part of the illustration. This is the spent fuel pool facility -- completely external to the reactor building and not subject to any transients, incidents or accidents occurring therein. This is particularly interesting to note when compared to the design seen at Fukushima Daiichi and in fact used at many, many other plants worldwide. Many early plants' spent fuel was located outside the primary containment. Getting back to boiling water reactors... It began to appear, with the high cost of reactor plants in general, but the (at the time, apparently) better cost and return figures of the boiling water reactors that the cost could be further improved if the containment were simplified. The answer came from an unlikely source; ALCO products. ALCO Products was an early reactor vendor, who exited the market in 1962. This was the former American Locomotive Company, which had diversified after the end of the war. ALCO had built a plant called the APPR or Army Package Power Reactor for the US Army and the AEC at Fort Belvoir, Virginia as a prototype; however, true remote siting of the plants as designed would seem to preclude large and heavy reactor buildings with thick heavy walls or large spheres. For the follow-on plant, APPR-2 or later known as SM-1A at Fort Greely, Alaska, ALCO and its contractor designed a novel type of containment that did not need to hold against such maximum accident design pressures since it would use a pool of water to quench, or suppress, the steam from such an accident. With the use of this pool, the overall secondary containment could be made lighter and less expensive. General Electric adopted this concept for boiling water reactors (the ALCO plants were all pressurized water) and first used it at Humboldt Bay. Below is a rough representation of the early style of vapor suppression containment such as in the ALCO plants and Humboldt Bay. 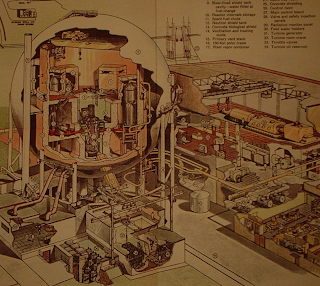 This style of design had its drawbacks, and after interim designs of BWR reactor plants a new toroid style chamber was adopted, piped to a "drywell" that fully enclosed the reactor vessel. This drywell / suppression chamber structure was then surrounded by a heavy concrete biological shield structure, and then finally by a reactor building. 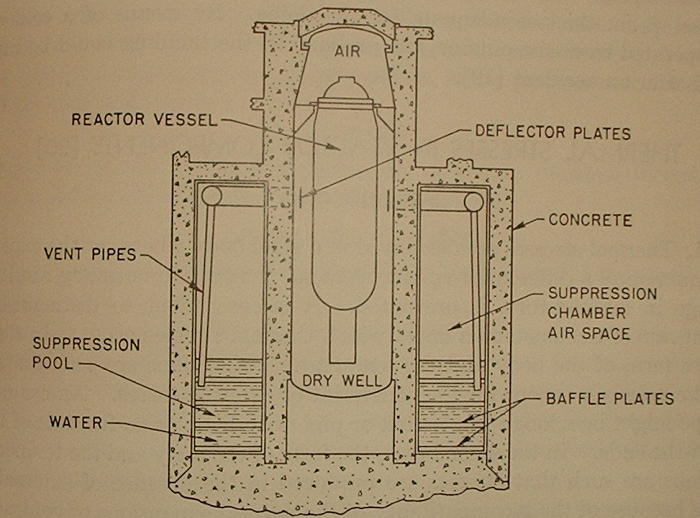 Below, seen before on this site but shown here for full continuity are some illustrations of reactor - dry well - suppression chamber structures and the containment and reactor building. In the design above, there are by definition two "containments," both a primary and a secondary. 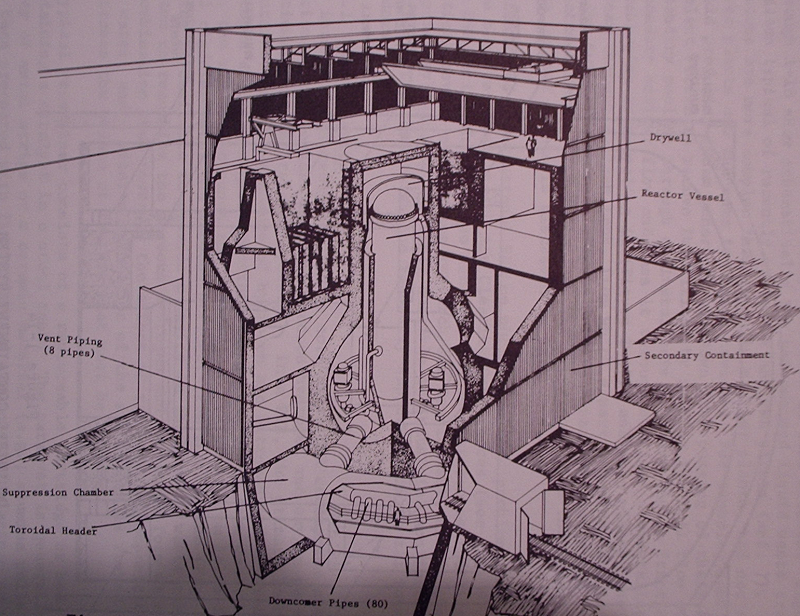 The primary is the dry well surrounding the reactor; the secondary is the heavy concrete structure poured around the drywell and which is enclosed by the reactor building constructed outside of, and on top of, the secondary containment. Now we have a few historical and structural details, for background, on containment structure. These will become more and more discussed in far greater detail in the press as it begins to go over how it was possible for all the releases at Fukushima Daiichi to occur. We have much more information than this at hand, naturally, and will respond to press reports (and hysteria, and inaccuracy) as necessary. The Japanese have not been forthcoming today with a slew of technical updates; this may well be because most efforts have slowed except those to dewater the turbine buildings so that access to the feed and condensate systems is possible. Nos. 1, 2 and 3 are now all on freshwater injection to the reactors; on all three this is being done with pump vehicles. The US Navy has sent a barge with fresh water to be used as coolant, shown on various media. TEPCO indicates that the freshwater injection to No. 2 plant is borated. As of 5:30 PM Tokyo time, lighting was available in the No. 2 control room. Hopefully more information will come out today. Whether it does or doesn't, we'll be providing a status check today and an updated technical overview.. that ANYONE can understand .. about the events at Fukushima Daiichi. Apparently the latest NISA briefing has been conducted without live television coverage being made available anywhere. This is because it's Saturday in Japan already .. not because of any attempt to cover anything up. We do have just a couple of details, however. -All of the turbine buildings at No. 1, 2 and 3 plants have contaminated water of varied depths and activities, but all are fairly deep (up to one meter) and are highly contaminated. All appear to be primary coolant. TEPCO is hurriedly developing a way to dewater these buildings to allow operability of the feed and condensate systems. 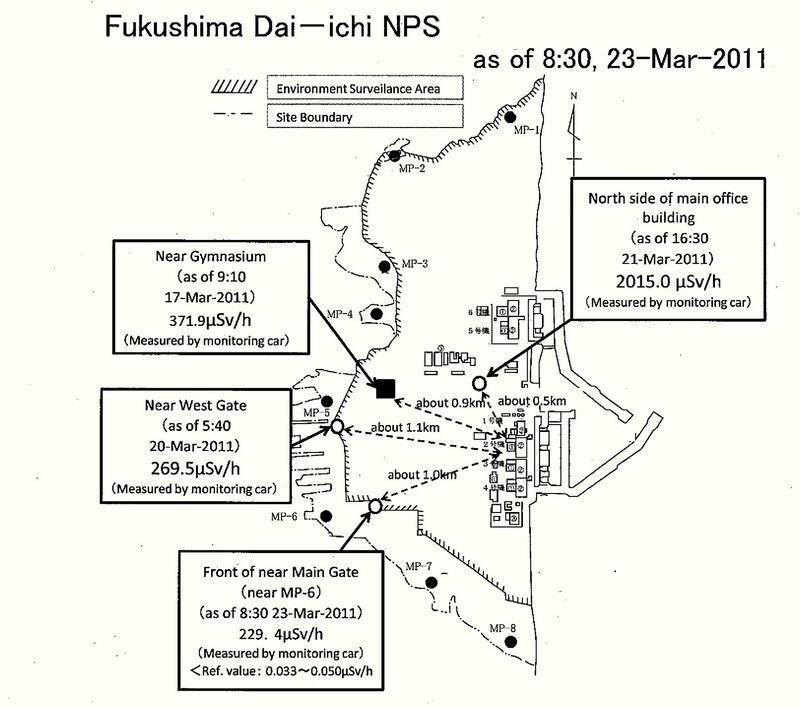 -Radioactive Iodine content as measured at the south water outlet at Fukushima Daiichi is something like 1200 times the federal limit. It has been going up a bit for a couple days and now has really spiked. -TEPCO has resorted to using trucks temporarily, with hoses (these are pump trucks) to get freshwater into the primary reactor plants due to the high rad areas and contaminated water in the turbine / support buildings. -The contaminated workers were wearing no boots and ignored dosimetry alarms. The third worker did in fact have waterproof boots on and has experienced no exposure to Beta radiation. We are going to have to rely on the daily issuance of status documents from the owning, supervising and industry parties / agencies but this is good enough given the other facts we already have. Further evidence that the SBO or Station Blackout accident sequence experienced by Fukushima Daiichi No. 1, No. 2 and No. 3 plants may have led, as predicted, to both serious core damage (which is certain) and either pressure vessel failure (perhaps in the location of a lower head penetration, if not one of the other failure modes) or else containment structure failure is out today. Apparently now all three plants have very highly radioactively contaminated water in their turbine buildings. The latest JAIF status report reflects unknown pressure vessel status for all three plants, which is a change for No. 3 plant. No. 3, in previous documents had been listed as "damage suspected." This may be an upgrade if JAIF, NISA and TEPCO think that the coolant in the reactor buildings isn't due to primary system failure. Other data indicates that the temperature disparity on the No. 3 plant RPV is likely due to instrument failure since last reading of feed nozzle temp was about 33 degrees Celsius below zero. There is sure to be much more data as the day comes alive in Japan, and we'll be here to report on it. The latest JAIF status document reflects developments and gives observations essentially identical to those presented on this site last evening. The potential damage to the pressure vesssel in No. 3 plant is the most significant alteration. However, buried way down in the third page table of sequential events is the notation that indicates that there may have been leakage of water from the No. 2 plant's reactor building to the general drain system. There is a story on the wires now that a Japanese Government panel (and I haven't figured out who that is yet) has made a statment about fifteen minutes ago that the reactor vessel at Fukushima Daiichi No. 3 plant may be damaged. Given some of the information I've related earlier today, and the findings of heavily contaminated water in the turbine building that very probably went through the reactor, I might be inclined to agree.. although it's by no means clear what other information they might have, and have considered, that we haven't seen yet. UPDATE: Apparently this information came out during the untelevised Q&A portion of NISA's briefing. NISA seems a bit unhappy with TEPCO's Rad Health management as well. Interesting to note here is the increase in pressure and temperature, temporarily on the No. 1 plant. Note also a venting of vapor from No. 1 and a third occurrence of black smoke from No. 3, much less than the other two times. Found in ocean water; Cesium, Iodine, Ruthenium, Tellurium all above limits. We are beginning to get an idea of just how badly the fuel is damaged in the three installed cores and the four fuel pools. Well, the most alarming thing that came out of this briefing is the confirmation that the water in the No. 3 plant turbine building does in fact have TEN THOUSAND times the activity of normal primary coolant. NISA has just admitted that this indicates serious fuel damage. If my correlation is right, the water down there is about 105 microcuries per milliliter. Not any ten to the minus anything. That's mind blowing. Details on each plant really have not changed in terms of what was briefed. However, it was made clear in the case of every reactor and every fuel pool that it's highly desired to switch to fresh water instead of sea water as soon as possible. Just a note here that I've heard three reports now that the workers that received radiation doses of 170 mSv in the basement of number 3 plant were standing in water where the rad field reading at the surface of the water was 400 millisieverts/hr. That corresponds to 40 R/hr. Their dose, then, corresponds to 17 Rem. This is much like the radiation field in the same place at the No. 2 plant reported here a couple days ago. This high radiation field will surely hamper efforts as will the contaminated water pooling in the basements. UPDATE- Now TEPCO says "3.9 million becquerels per cubic centimeter" in the water in the No. 3 plant turbine building basement. This is 105 microcuries per cc. Is this even believable? We will see. It is now the morning of the 25th of March in Japan, and the first technical updates are available before the briefings today -- which as always we'll be watching and then reporting on. At this moment, only a bit of vapor is visible above the plants at Fukushima Daiichi, and no smoke. On the 24th, TEPCO put 120 tons of seawater into the spent fuel pool of No. 1 plant. No. 4 plant had 150 tons of seawater sprayed onto the spent fuel pool by the long-armed concrete pouring vehicle which has made much press in many areas. A number of pictures, which this writer feels will become iconic, have been made of this vehicle in operation beside the blown apart No. 4 plant reactor building. The seawater pump for RHR at No. 5 plant is back on line, and operating now.. the system was back on at about 4:30 PM local Tokyo time. Feedwater inlet nozzle and reactor vessel lower head temps continue to lower on all three plants with cores installed. Apparently TEPCO doesn't think the readings on feed nozzle temp on No. 3 plant are right (they've been widely disparate) and now the reading for this value on this plant is listed on two different documents as "Under Survey." It is probably the most curious of all the readings -- the very wide temperature disparity on this reactor alone. Control room for No. 1 plant has lights. Still no data on what I&C is energized if any. The latest JAIF status update available wasn't that exciting in terms of differences, but we'll link it here to provide complete continuity. Expect a lot more when the briefings begin. We're hoping to start to hear some bigger picture information about these plants soon as we begin to examine when we will see the end of the Accident Management / Accident Mitigation phase and enter the Cleanup phase. Particularly of interest to me is the fact that most prolonged station blackout fault analyses indicate significant core melt and probable reactor vessel failure, and even containment failure. One wonders what the exact status of the reactor cores is.. and given the vast hydrogen release, the release of fission products on a wide scale, and the high radiation areas it's likely that core damage in all three plants is very severe. I have no real intention of putting a lot of data on plant cleanup on here until the accident phase is over. However, while looking at a large and interesting volume here published by Martin Marietta in 1991 titled Nuclear Facility Decommissioning and Site Remedial Actions: A Selected Bibliography, I ran across an interesting statement. Since this book is a large annotated bibliograpy, today we'll see if we can track down the annotated original document it's describing for more data -- at least on a worst case scenario (which probably doesn't exist at the plants in Japan) basis for some further estimates. NISA (Nuclear & Industrial Safety Agency) has some new data out. No. 1 is down quite a bit from late yesterday. Rather odd is the continuous wide temperature disparity between feed nozzle temp and bottom head temp on No. 3 plant; yesterday the gradient was 80 degrees but the other way, with the feed nozzle temp being 80C higher. This makes it seem like a deposit of something (salt?) might be insulating the bottom head, but it's too complicated to guess without more data. PCV pressure and suppression pool pressures on No. 1 plant are on the order of 50 to 55 pounds per square inch. The limit is 76.5 pounds. Core water level readings on all three plants, where available, are "both low" ranging from -1200 mm to -2300 mm. It seems sure that some of the upper part of each core remains uncovered with water. Other news: Two workers have been hospitalized after being exposed to high radiation in the No. 3 plant, in the basement area of the turbine building adjacent to the reactor building while trying to reconnect electric power. There are probably high rad areas in this location in all three plants with reactor cores installed. The men seem to have Beta radiation burns. One other worker was exposed at the same time, but not hospitalized. Apparently contaminated water entered their boots while they worked in a water filled area. The No. 1 plant control room has lighting as of 11:30 AM Tokyo time. Updates in a flurry as the day gets moving in Japan..
TEPCO indicates that the pump that tripped at No. 5 plant was the temporary Residual Heat Removal System seawater pump. They're on it. TEPCO has released a detail about the jury-rigged system they'll try to get working on units 2, 3 and 4; they've hooked up externally to the Fuel Pool Cooling and Filtering / Cleanup system and are injecting seawater through it into the spent fuel pool of No. 3 plant. We mentioned this before on this blog. Latest JAIF status includes information that No. 3 plant's containment is intact. The document also mentions a high rad area in No. 2 unit turbine building; see remarks section. Plants 5 and 6 are listed as running their Residual Heat Removal pumps to maintain core cooling; perhaps 5 and 6 are getting close to something like a normal shutdown lineup and environment. Chief Cabinet Secretary Edano's briefing is going on right now, and although his prepared remarks didn't include any nuclear plant details he's getting questions about it. However since he clearly got briefed by TEPCO and NISA, and NISA just gave its briefing to the press about an hour ago he didn't have any extra information beyond what is in the documents and what NISA gave. No. 1 plant: At 9 PM last night TEPCO began injecting water through two simultaneous paths, but containment pressure started to rise. Water injection rate was lowered at 2:25 AM from 178 liters/minute to 160 liters/minute and pressure lowered and is now stable just below the design containment vessel pressure. This unit's spent fuel pool is not making much heat but TEPCO plans to get seawater injection running on this pool probably tomorrow. No. 2 plant: Temperatures relatively stable; will not put water into drywell today but will into pressure vessel. 40 tons of water went on the plant on the 20th and 18 tons on the 22nd from 4:07 PM to 5:01 PM, for spent fuel pool. Work on this plant is being held up by some high radiation areas. Seawater injection continues. No. 3 plant: No black smoke today; no good reason as to what caused this although NISA notes that there are some pumps on that side of the reactor building and it could be their lube oil burning. Put 35 tons of water in spent fuel pool from 11:03 to 13:20 on the 23rd, and today beginning at 5:35 AM about 500 tons of water will go in the pool. No. 4 plant: Fuel pool is the issue here and seawater injection continues. No. 5 plant: Tripped a seawater pump; no core cooling at the moment but temp is stable and the pump should be fixed today. No. 6 plant: No issues. Probably two more briefings and a flurry of documents to come before noon Tokyo time. Work stopped at Fukushima Daiichi site, due to smoke/vapor issuing from all FOUR reactor plant buildings. This is the first appearance of vapor from No. 1 reactor plant. Here is the latest JAIF status document, with no important changes; No. 5 and No. 6 are on external AC power. As of noon local (Tokyo) time on the 23rd, No. 1 reactor was still seriously overheated with a feedwater nozzle temp of 345C and a lower pressure vessel head temperature of 350C. (These are about 655F.) Of course, we've already reported some of the high temps and this is old data just released from Noon on the 23rd; it's now roughly 11 PM or eleven hours later. However, with the increase in core injection having begun at 2:33 AM .. up to 18 cubic meters per hour.. this might well have stopped or else is not effective. Sure to have more on this later. Water injection to the primary plants is going to be shifted over to the normal feedwater system, and it looks like that's being done at No. 3. However, at No. 2 plant workers attempted to approach the area to work on the feed system to operate it for seawater injection but encountered a radiation field of at least 500 millisieverts per hour. That's 50 R/hr. This area, to be clear, is in the turbine building. At this moment all restoration work has stopped at all four plants. Apparently shortly after the new, second appearance of the black smoke at No. 3 plant the TEPCO officials ordered a further site evacuation. All three reactors have had measurements made on their external vessel temperatures and all were high, at least one being over the design limit of 575 F, and increased cooling was underway at all three in one form or another when the latest evacuation was ordered. So far, radiation levels at the site have not gone up -- which makes us pretty sure here that the spike the other day was due to a release from the No. 2 plant, and not the No. 3 plant. Just what is burning, however, in the No. 3 plant isn't very clear. 11:00 AM Weds UPDATE: We've had a couple people email here noting that somehow the original report was high as to rad levels in the turbine building at No. 2 plant. Considering the situation, 50 R/hr seems possible, even if unlikely.... However, that was the amount reported in several Japanese media at the time. Whatever the case, it appears that high rad levels are still as of late Wednesday (Tokyo time) holding up work at No. 2 plant; NHK television's overnight loop analysis spot mentions the lack of progress at No. 2 compared to the other plants and notes the high rad levels at No. 2 as being the cause. So, even if that initial report on rad levels is high, it's still a problem at No. 2. FURTHER UPDATE: After looking at some Western media, they're correcting a story from Wednesday about "highest rad levels yet on site" which they ran on Wednesday. The story really covered a reading, wrongly reported, from the 18th. So what happened was that one western media outlet got it wrong, and all the others parroted it. This is why I only read the technical papers and files from the authorities and only listen to the technical bodies, the plant owners and the Japanese government and media. I highly recommend the western media figure out how to do that, and stop promulgating and then re-correcting garbage reports. Apparently something happened with the latest NISA Seismic Damage Report document, and it's kind of garbled but I can read enough of it to relate the following facts. I'll put the new information in print, and then my words in parenthesis. Another public release contains a couple of good rad survey maps for the Fukushima Daiichi and Daini sites. So we see the maximum reading on these charts anywhere is 2015 microsieverts per hour, which converts to 201.5 mr/hr. At TMI, readings on site varied from 800 R/hr at the containment dome ( !!!! ) all the way down to 5 to 10 mr/hr variously around the site, 365 mr/hr at the NW site boundary, and 1-5 mr/hr in a wide number of places. A couple days after the accident, some higher readings appeared; two days later a reading of 38 mr/hr NE of the plant was recorded. Considering the recent findings of Iodine in the water supply in Tokyo, there has been some release from the plants aerosolized and lofted. 5:57 AM .. edit to correct chart labeling. First released view, courtesy TEPCO and NHK TV Japan, of the interior of the control room at No. 3 plant at Fukushima Daiichi nuclear generating station.